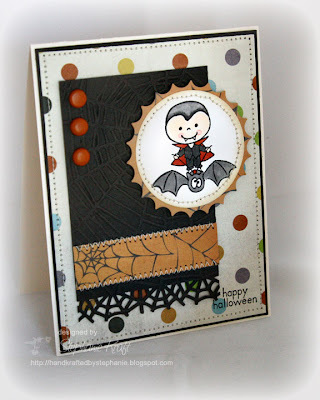 HandKrafted by Stephanie: Happy Halloween! Good morning! I'm back with another Halloween card! I think I've made more Halloween cards this year than ever before... I just hope I remember to send a few of them out! I used Mercy's Tuesday Sketch #39 for my layout. It was such a fun one to use that I know I will be using it again soon! My image is from the newly release Pink Cat Studio set, Itty Bitty Halloween. Instead of adding a ribbon around the card, I substituted a strip of patterned paper and stitched it onto my Smokey Shadow rectangular panel. I also embossed the panel with the Cuttlebug spider web embossing folder, but it really doesn't show up well in the photo. Accessories: Circle and Inverted Scallop Circle Nestabilities (Spellbinders), Spider Web embossing folder (Provo Craft), Spider Web border punch (Martha Stewart), Markers (Copic), Brads, Foam tape, Thread, Sewing machine. Such a darling card! He's soooo cute. Too cute! I love the way you combined the CB folder and the spider web punch.